“Hairdressing was the furthest thing from my mind,” smiles Birchler. Originally from the East Bay, Birchler ran in a tough crowd of professional boxers and kick boxers. Yet every time he visited his girlfriend at work he was inspired by the dynamic energy and creativity in the salon. With her encouragement, Birchler applied to beauty college in Sacramento. “I didn’t tell anyone,” he says. He teamed with friend and colorist, Amanda in an artist’s loft with panoramic views from the 11th floor of the old Asahi building. Word-of-mouth swept the city and soon Birchler’s reputation for architecturally genius cuts earned him a fierce following running the gamut from actors and musicians to college students and housewives. Within five years he had outgrown the space and began searching for a new location to expand his vision. One of the things Chase loves most about what she does is watching a client transform in her chair. Rather than generating a “signature look,” Chase prefers to customize each cut to suit her client. “Not just the bone structure and hair texture,” she says, “but fine-tuning it for each personality.” For Chase, form and functionality are paramount, which makes perfect sense given her background. In 2001, Chase graduated from UCSB with a Bachelor in Fine Arts. She went on to work in Product Design for Modern Architectural Inc until 2008 when she decided to swap budget restraints and creative restrictions for her first love, hair. 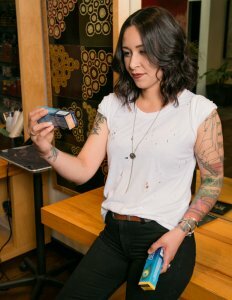 Having cut hair on the side for friends and family since college, she decided to formalize her training at the Vidal Sassoon Academy in Santa Monica. After graduating, she went on to work at the Vidal Sassoon Salon in Beverly Hills until 2011. Chase joined Chop Chop in February 2011. An Orange County native, Marissa fondly remembers hanging out in her family’s salon. At the age of 15, Marissa discovered her natural talent when she first experimented with color in her own hair. Two years later, she began her formal education at Golden West College in Huntington Beach. 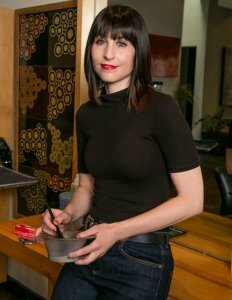 In 2007, she left Southern California for San Francisco and landed a job at a high-end salon where she was trained under Vidal Sassoon instructors. Irene knows firsthand what it’s like to have challenging hair. She explains that her mom didn’t have the first clue about working with her curly hair when she was a kid, which motivated Irene to learn how to “tame the beast” on her own. She eventually decided to further her natural talent for hair mastery at the Vidal Sassoon Academy in Santa Monica where she graduated in 2003. 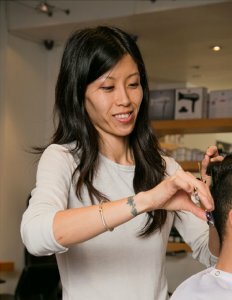 Irene joined the team at Chop Chop in April 2013 and looks forward to working with you. 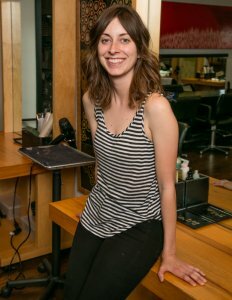 Lauren has loved playing with hair for as long as she can remember, but it wasn’t until her hair stylist told her about Vidal Sassoon that she considered cutting hair herself. When she turned 17, Lauren sent off a perfunctory college application “just to make people happy,” but had her mind set on the Vidal Sassoon Academy. 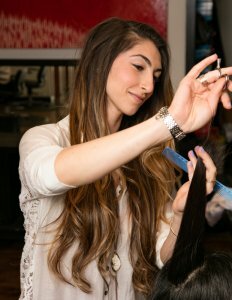 After graduating in 2008, Lauren landed a chair at the Beverly Hills salon. She remained there for three years before seizing the opportunity to move to Chicago where she worked in the salon and taught at the Academy. “It was an incredible adventure,” says Lauren. “I’m so glad I took the opportunity to live somewhere completely new and different.” But after three years in the bitter cold, Lauren knew she belonged back home in California. She returned to the Beverly Hills salon for two years before joining ChopChop in April 2015. Meghan’s talent crosses the spectrum from classically beautiful to fun, edgy color that accentuates her clients’ best features and skin tone. An excellent listener who stays up-to-date with current trends, Meghan feels a good consultation is the cornerstone of her success. “Sometimes you have to interpret a client’s goals to make sure their color will work with both their lifestyle and maintenance habits,” she says. Whether she’s working with vibrant reds, beachy blondes or rich brunette hues, her attention to detail and focus on upholding the integrity of the hair keep her clients’ tresses looking healthy and shiny. Though Meghan always expressed a strong penchant toward creativity, she followed in her father’s business-oriented footsteps and graduated from San Diego State University with an economics degree. After landing a job underwriting business loans at a prominent bank, it didn’t take long for the confines of cubicle life to spark Meghan’s interest in exploring a new and more exciting career path. She made the decision to attend cosmetology school and never looked back. Zanne graduated from the Vidal Sassoon Academy in 1999. She went on to attend advanced training programs and master classes in addition to being awarded a one-on-one scholarship with Tim Hartly, International Creative Director of Vidal Sassoon. In 2007, after advancing from management to head educator and creative director for several salons, Zanne opened her own salon in Venice. In 2013, she relocated her business to Beverly Hills. We are always looking for qualified stylists. Inquire about our in-house education cutting or coloring classes.